Skunk cabbage (Symplocarpus foetidus) is staring to leafing out in wetland areas so I know that spring is really here. Pretty soon, the ground in swampy areas will go from brown to green almost overnight as the skunk cabbage leaves unfurl. Skunk cabbage leaves are pretty cool–big & wide, deeply veinated–but it’s the blooms that get most of the attention. It’s the first plant to flower in many areas. Skunk cabbage blooms before it leafs, as early as February even in cold areas. Its dark red spathe covers its spadix like a hood, similar to a jack-in-the-pulpit. The flowers metabolize very quickly, so fast that they generate heat in the process. The heat can raise the temperature outside the spade by 15 degrees Celcius. What this means is that the skunk cabbage can actually melt snow. When trampled or bruised skunk cabbage emit a pretty foul odor, which attracts pollinators. It fares best in the mucky soil of decidious shaded wetland forests, swamps, and floodplains. Its also known as polecat weed and should not be confused with Western skunk cabbage (Lysichiton americanum). 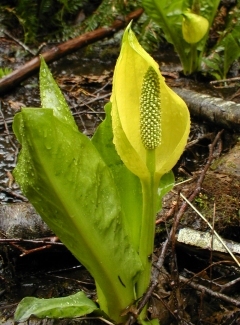 Although they’re cousins–both are members of the Araceae family–skunk cabbage is found from Nova Scotia west to Minnesota and south to North Carolina, while Western skunk cabbage is found from Montana west to British Columbia, north to Alaska, and south to California, and has a soft yellow spadix (see below). Top photo courtesy of the Lady Bird Johnson Wildflower Center. Second photo courtesy of USDA. Western skunk cabbage photo courtesy of Wikimedia. They are amazing plants .. also mentioned and pictured so well in “Away From Her” .. I think a lot of people watching the movie will remember that plant ! What an unusual plant; I’ve never seen these before. PS: When you can, Joe and I would still like an answer re: the maples (I commented on that post a few days ago). thanks. I love skunk cabbage, though I typically see them in drive-bys along the wooded roadsides around here so I miss the blooms. But that particular shade of green is so refreshing! As welcoming as spring itself. Lovely photos! I miss skunk cabbage from my days in upstate New York. What a cool looking plant. I have never seen anything like it in my area. Ooh! I may have missed skunk cabbage at my local arboretum this year, but it is an amazing plant! I love skunk cabbage. Cool flower and lush leaves! Spring is here when the skunk cabbage flowers! I’ve never seen anything like this! I can’t say the name is all that appealing but they are a fascinating plant to behold. I just love this post on skunk cabbage…we call them “uncle skunk cabbage” for the native legend. Ours are golden yellow and pungent. I will put up a picture on the blog. They have just opened up. Cheers from ocean and her island. Skunk Cabbage is a beautiful flower with an unpleasant smell but I like it very much. Here in Brazil people dislike it for its smelling. I will post on my blog about this beautiful plant. What do you think about a giant skunk cabbage at Botanic Garden in Germany? So I had one of these plants in my backyard for 10 years! I’m just starting to get an understanding of what a treasure I had back there. Is there anywhere I can find this plant in southern california region? How about northern california?